What’s a livable streets activist to do? The city is about to commit four-to-god-knows-how-many-billions of dollars to replace a 1.5-mile stretch of the crumbling Brooklyn-Queens Expressway under Brooklyn Heights — and one thing is increasingly, painfully, clear: there is a good chance that the de Blasio administration won’t learn from Robert Moses’s original mistake. The mayor says the roadway is a critical part of New York’s infrastructure — but is it? Yes, 153,000 gas-guzzling vehicles — including about 14,000 trucks — use the BQE every day. But it serves no one else: not cyclists, not pedestrians, not even Brooklyn Heights residents, who are almost entirely cut off from the multi-billion-dollar Brooklyn Bridge Park so tantalizingly close. The highway’s only positive attribute? It keeps many of those cars off local streets. Or does it? Isn’t there a better solution than replacing a roadway that only creates more opportunity for drivers to pollute the air and clog our streets? And shouldn’t the livable streets community (good morning, all) play a more decisive role in the decision to commit so much money on a project that benefits so few and has so many downsides? The Brooklyn-Queens Expressway is one the city’s largest projects ever, so it’s clearly an opportunity for transportation advocates and the livable streets movement to jump in and steer the conversation so the city doesn’t just make the same mistake it did 70 years ago by building the six-lane expressway in the first place. First, what are the prevailing plans and why should you care? 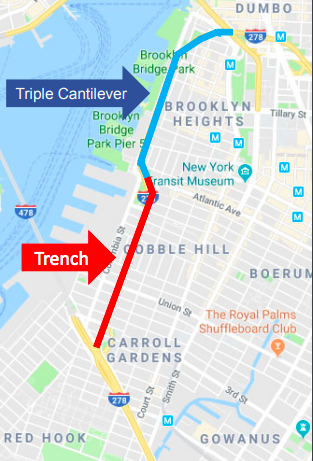 In September, the Department of Transportation proposed two equally expensive — and equally unpalatable — options for rehabilitating the triple cantilever structure between Atlantic Avenue and Sands Street: a $3.2- to $3.6-billion plan that would tear down the historic Brooklyn Heights Promenade to make room for a temporary six-lane highway until the new roadway is done in six years; or a $3.4- to $4-billion plan to rebuild the expressway lane by lane, potentially creating traffic jams for up to 12 miles, taking longer, costing more and lacking additional improvements to the Promenade and several interchanges. The Brooklyn Heights Association tapped local architect Marc Wouters to dream up an alternative plan to save the Promenade — but it would still allow for the same amount of traffic with six lanes. His proposal calls for creating a temporary two-level structure for expressway traffic closer to the Furman Street border of Brooklyn Bridge Park, featuring one level with three lanes for Bay Ridge–bound vehicles, and the second with three lanes headed towards Queens. Another longtime Brooklyn Heights resident, Mark Baker, has his own proposal: the tri-line plan, which would also allow for as many as 153,000 vehicles each day. Baker’s plan calls for relocating the BQE to a new road on Furman Street that would be enclosed in a “box-like” structure. Another local group, A Better Way, tapped the Regional Plan Association to come up with another plan. But the RPA stopped short of calling for the roadway to be fully torn down and proposed nixing just two lanes of traffic. Comptroller Scott Stringer wants to ban all cars, make the expressway truck-only, and cover it with parks [PDF]. And the newest proposal is from firm Bjarke Ingels Group, which calls for a six-lane roadway decked over with a linear park. But BIG’s plan also would allow for the same amount of traffic. And, lest we forget, there are plenty of ways to reimagine the BQE as a low-impact, at-grade, tree-lined boulevard. Many cities — including New York after the West Side Highway started falling apart in the 1980s — have torn down ancient and bad elevated highways to stimulate growth, housing, parks and commerce. No heavy-hitter has revealed such a plan for the BQE, but someone will. Why is the city capitulating to the Brooklyn Heights Association? The powerful civic group made its bones when it got Moses to change his mind about building the highway through the tony neighborhood decades ago — a deal that ended up creating the fabled Promenade in the first place. Now flush with cash and influence, the BHA has again exerted itself, getting the city to change its mind about the BQE, which led to this week’s creation of the mayoral panel. But still, the Brooklyn Heights Association clearly favors rebuilding the highway for 153,000 cars, as long as they are not in their neighborhood and as long as the new highway has some green space on top of it — locals applauded the Bjarke Ingels Group’s six-lane plan during the massive town hall last week, and the BHA endorses Wouter’s plan for six-lanes of traffic, just further from their homes. The BHA is right to push for a better plan than what the city has so far come up with, but as long as there is room for more than 150,000 cars going through the neighborhood every day, there will still be pollution. And several lower-income neighborhoods have similarly had to bear the brunt of traffic and air pollution, but their noise and suffering has yet to make the city look twice. The Brooklyn Heights Association has spent a total of about $85,000 on experts, and the local group fighting the city’s plans, A Better Way, spent $45,000 to lobby the city to find an alternative solution, according to reports. Why didn’t the mayor put a single livable streets activist on the “expert” panel? Mayor de Blasio named 16 people to an “expert” panel tasked with coming up with a new design for repairing the aging highway, saying the city needs to “get this right.” But whose definition of “right” will prevail? Clearly not the definition that favors a low-impact approach, given the composition of the panel: It’s stacked with engineers, architects, and other urban planners, and not a single person from the livable streets movement. StreetsPAC, Transportation Alternatives, Riders Alliance and other groups whose mission is to reclaim our streets from cars are not represented at all. Why is nobody talking about knocking it down entirely? Of all the many proposals, none is bold enough to suggest knocking down the BQE in its entirety and turning in into a boulevard-style roadway — a precedent set in other cities around the world, including Seattle, South Korea, and even in our very own Manhattan. Decades ago, the city tore down the West Side Highway, which according to the Regional Plan Association, used to carry about 140,000 vehicles per day, roughly the same amount as the BQE. Council Speaker Corey Johnson merely toyed with the idea when he suggested the city study tearing it down entirely. But where would all the cars go? The closest thought-out proposal to simply tearing down the BQE is Stringer’s plan to ban all cars and make the expressway truck-only between Hamilton Avenue in Carroll Gardens and the Brooklyn Bridge in Dumbo. Drivers would be diverted to either local roads, other expressways, or to public transportation. But would local streets be overwhelmed with cars? Even the city’s top accountant doesn’t know. “That’s the million-dollar question,” Stringer said on Wednesday at a town hall on the looming BQE-fix that drew hundreds of people and other local elected officials. But he wasn’t being facetious. The comptroller also reminded audience members about the well-proven theory of “induced demand,” namely that if a city builds more highway capacity, it creates more demand for those highways. At the same time, reducing lanes reduces the amount of driving. The only question is where will the cars go? Stinger said city and state transportation officials must invest in expanding public transportation to pick up some of the slack from those commuters who decide to hop out of their cars and onto the busses or subways. A large majority of cars on the BQE either use the free bridges (Brooklyn or Manhattan) or the Battery Tunnel to get into and out of Manhattan, Stringer said. That suggests that there are alternatives for the roadway between the tunnel and the bridges besides a super-highway. Why is anyone even considering anything before the impact of congestion pricing is known? The Department of Transportation will begin its environmental review of the project this summer — before it knows the impact of congestion pricing, which will not even begin until Jan. 1, 2021. Regardless of whether you support tolling drivers to get into Manhattan or not, the congestion pricing tolls have not even been set yet, so it is unclear how driving patterns will change. One thing is certain: those patterns will change, so any traffic data that the DOT is using for its BQE plan will be obsolete overnight. Remove and restore the pre existing street grid. BHA wants to wreck the Brooklyn Bridge Park where all those nasty people from the rest of the city go, and save the promenade. Stringer seems to have picked up my suggestion, which I added to in an e-mail to the project staff, though with a “park” element. Truck only or no, the roadway narrows to two lanes at some point prior to cantilever section. And if congestion pricing were to reduce the level of toll shopping, two lanes in each direction ought to be sufficient, and that could be on the lower level only, simplifying the rebuild. Look at the NYC truck map for Brooklyn. Where do you want all those trucks to go? This might be better phrased as, “…must invest in expanding public transportation to give drivers an option that can motivate/enable them to hop out of their cars and onto the buses or subways.” If you provide it, they will switch. One partial solution, which you touched on in the article, is to build a road over the trench part and create a proper BRT friendly street. Drivers can’t complain that you’re taking away street space for cars and parking because you’re adding road that didn’t exist before. Eventually the trench underneath can be filled in because there will be a workable public transit system in place to alleviate traffic and the number of drivers should decrease over time. Naturally the residents will have issues with turning their “local” streets into a large avenue (despite the fact that the BQE is literally right there anyway) so then the street will have to be redesigned with slowing measures to make it safer. This is an incredible opportunity to create a livable street that we all have been waiting for without even removing lanes and parking spaces that car owners fight so hard to keep. Hopefully over time we can remove the lower portion. The article forget to mention DeBlasio’s plan. Check out to focus on his national ambitions, use a commission to delay, hope the road falls down creating a crisis after he is gone, and punt the whole thing to whatever Cuomo would impose on an “emergency” basis. It’s like Cuomo’s plan for the Canarsie tubes. Better disaster later than inconvenience and diminishment now, especially since the situation they have inherited continues to hand them choices between the two. There was a time when selling the future actually got you something in the short run. That time is over, and you have to sell off more and more just to limit the damage. So, take me right back to the track, Jack! The trucks on the BQE are not passing through Long Island on the way to somewhere else. Aren’t you proposing horse and buggy? If we could start building new subway lines at the world average of $200 million per mile, $4 billion will get us 20 new route miles. That should be enough to extend the E/F and #7 to city limits, plus build a spur from Forest Hills along Jewel Avenue out to at least Springfield Blvd. This will fill in the major gaps in subway service in Queens, putting most people within a mile of a subway. It will also decrease bus traffic at key transfer points, perhaps dramatically. This is a far better use of $4 billion than rebuilding what is really a white elephant. Keep all 6 lanes of the BQE to accommodate regional traffic since it connects to the rebuilt Kosciuszko Bridge into Queens and to the rebuilt Goethals Bridge into New Jersey. Select the “innovative” DOT plan with the elevated structure which temporarily replaces the promenade with the detoured highway. Have the government provide relocation assistance for the residents to temporarily evacuate each of the buildings adjacent to the promenade & BQE. After the residents in the adjacent buildings have moved away, begin construction of the triple cantilever structure around the clock. This project should be completed much sooner since 24 hours of construction can take place everyday after the relocation of these nearby residents. Rebuild and reopen the promenade after the cantilever and BQE are rebuilt. Residents then move back into the adjacent buildings that they had left. Just do what BIG said. I suspect we are getting a lot of TLC licensed folks here. The roadway needs 6 lanes (3 each way) regardless of any congestion pricing scheme to reflect its demand as it connects the Outer Boroughs together (Staten Island to the Bronx). Although the BQE narrows to 2 lanes in the southbound direction past the Williamsburg Bridge exit, it would gain the 1 lane back with the new Manhattan bridge interchange. The roadway narrows to two lanes in each direction — near the Brooklyn Bridge westbound and at the split for the tunnel eastbound — and backs up in both directions. In fact, avoiding tolls backs up the road twice eastbound — at the tunnel split and at the Brooklyn Bridge exit — despite a modification to reduce the latter delay. You could say, based on the road space in Houston, that the road needs 20 lanes in each direction, and that most of Brooklyn should be torn down and replaced by roads for those passing through. But just tearing down as much as they did for roads from the 1940s to the 1960s nearly bankrupted the state — with the federal government footing more of the bill. You want Houston? It’s right there for you! The issue is not adding more lanes but rather keeping the existing 3 lanes that are present. If the roadway already backs up now then reducing lanes will not reduce the congestion that is already there. Although the roadway narrows to 2 lanes in one direction at certain sections, 1 lane is added back to that roadway segment shortly thereafter which provides the net effect of 3 lanes in that direction. $200m/mile is for tunnels, tracks, and power. You could get 20 miles for $4b, but you wouldn’t get any stations. It's time for a boulevard-style roadway, not a $4-billion highway repair.